Interesting, unusual or otherwise surprising findings along the side of the road, parking lots and other places cars usually go! Description: I don’t know if you have looked down at the roads and parking lots when you travel, but there are some very interesting items being discarded in these areas. I decided they were worth recording and perhaps discussing a bit. It seems that our current culture is leaving some interesting finds for future anthropologists. We are taking a bit of a detour in our “Kicked to the Curb” series to show something else found in a local parking lot. It looks like someone is getting a very special Christmas present this year. I’m thinking that the name Lucky is going to apply to more than just the item in the truck. 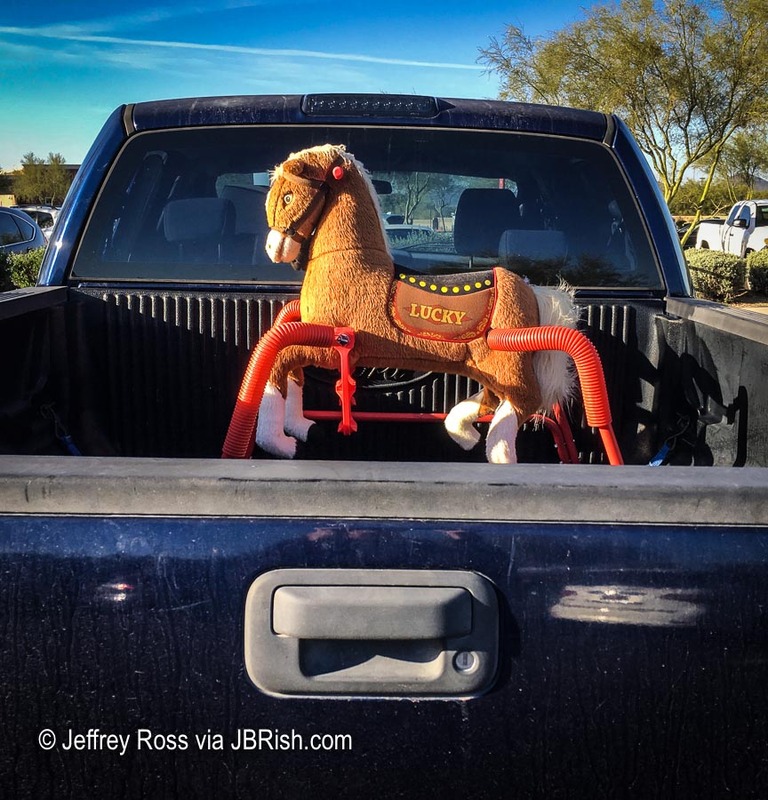 Wouldn’t every child want a pony for Christmas? And this looks like a very special one indeed! 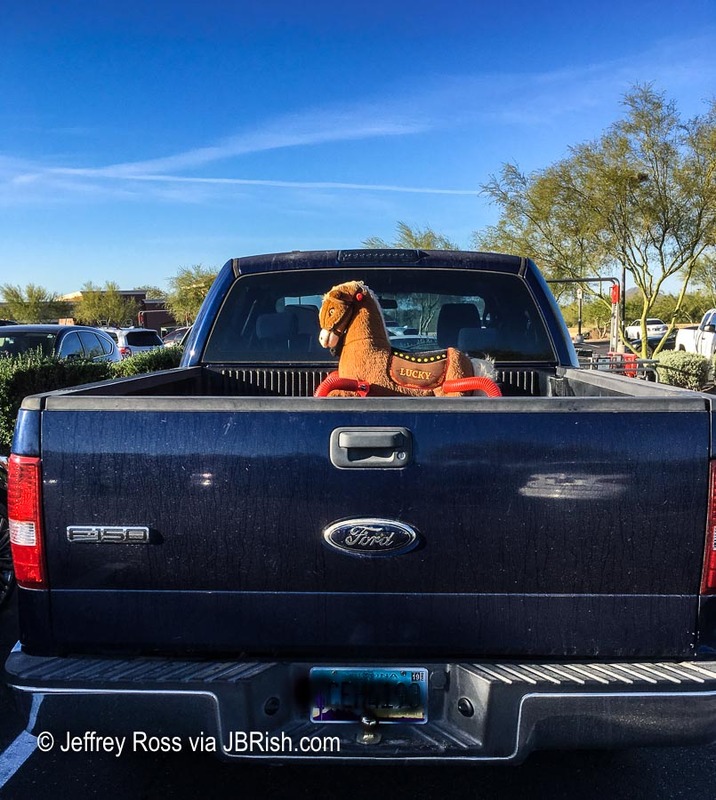 Continuing our “Kicked to the Curb” series I ask if you can identify this item found in a Lowes Home Store parking lot in Phoenix, AZ. 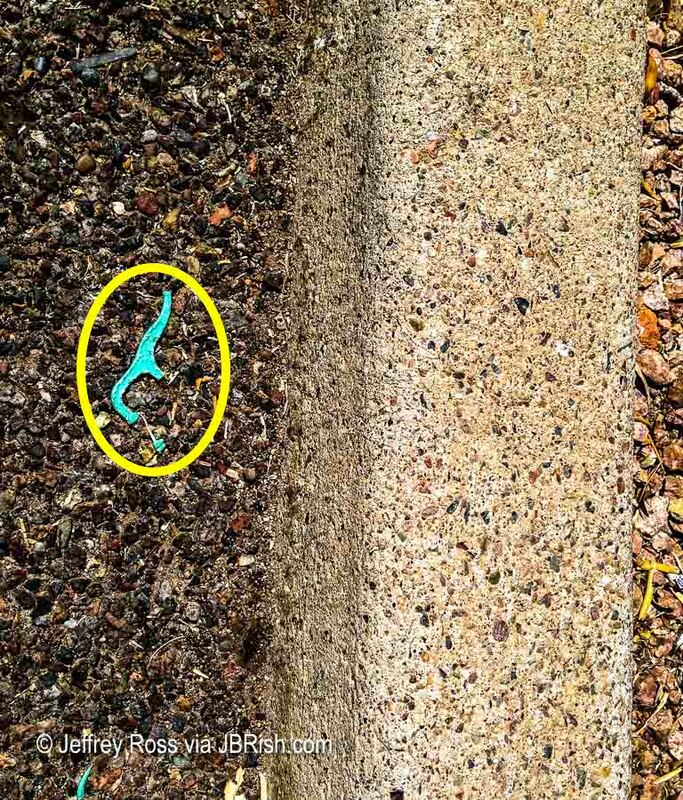 What is that item to which the yellow arrow is pointing? If you haven’t guessed, it is a toothbrush. 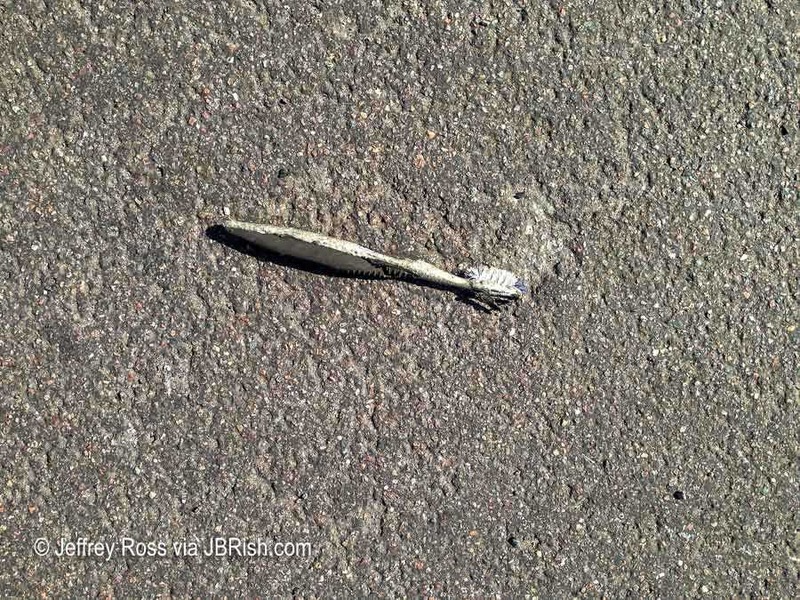 Of course it is hard to say how much of that wear and tear is from dental hygiene usage and how much is from parking lot abuse. One might also question how this item arrived at this particular location; Hmmm! I am going out on a limb here and make an assumption that you know what the item is that appears inside the yellow oval below although it is somewhat broken. If you haven’t guessed, it is a dental flossing pick. A bit more than a year ago, my wife pointed out an interesting phenomenon that I hadn’t noticed. She told me that she finds many flossing picks discarded in parking lots or along the roadside. I am one who flosses with a pick on a more or less regular basis and as hard as I try, I can’t imagine how people “floss on the go.” I usually initiate this routine over my bathroom sink with water running and occasionally lubricating the pick with the water. 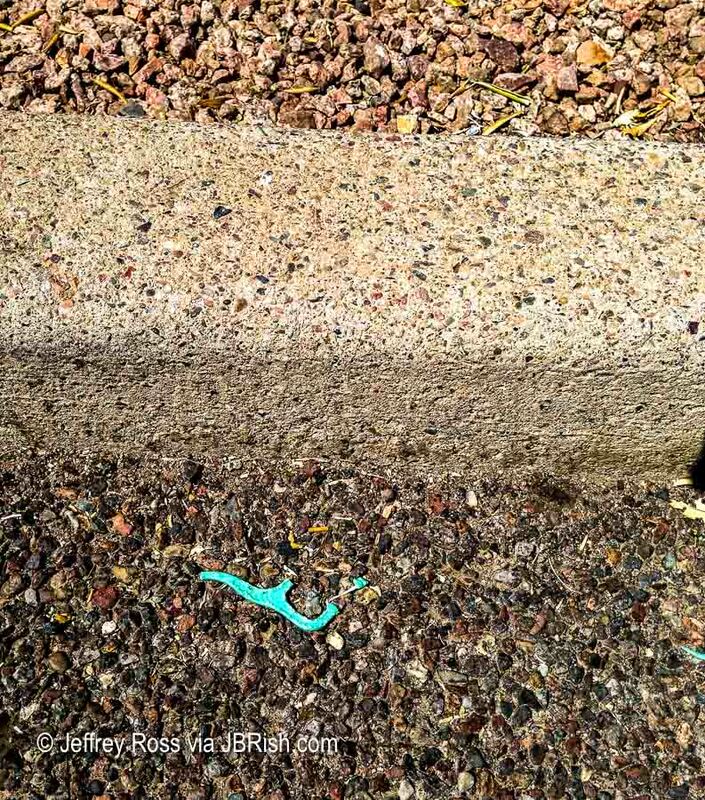 Once I was made aware of this unusual occurrence, I began to notice that there were many flossing picks discarded in parking areas. I am wondering if perhaps I am unaware of alternate uses for these devices. If you can offer some insight, please leave a comment below. Description: I don’t know if you have looked down at the roads and parking lots when you travel, but there are some very unusual items being discarded in these areas. I decided they were worth recording and perhaps discussing a bit. It seems that our current culture is leaving interesting finds for future anthropologists. 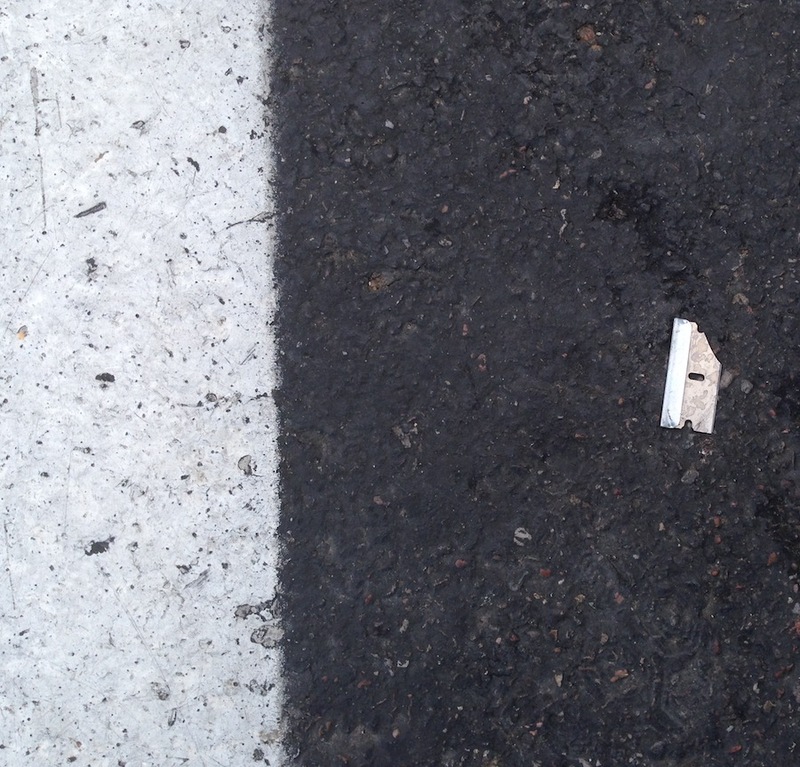 While parking at our local grocery store, I saw a broken razor blade just off to the side of my front tire. It was curious to find this artifact at this location and it raised several questions in my mind. Why was the razor there? What was it used for at this location? Was it discarded on purpose? Why wasn’t it picked up after being dropped and discarded properly? It is truly a puzzle. **NOTE ** the white line is the dirver’s side parking lot stripe. 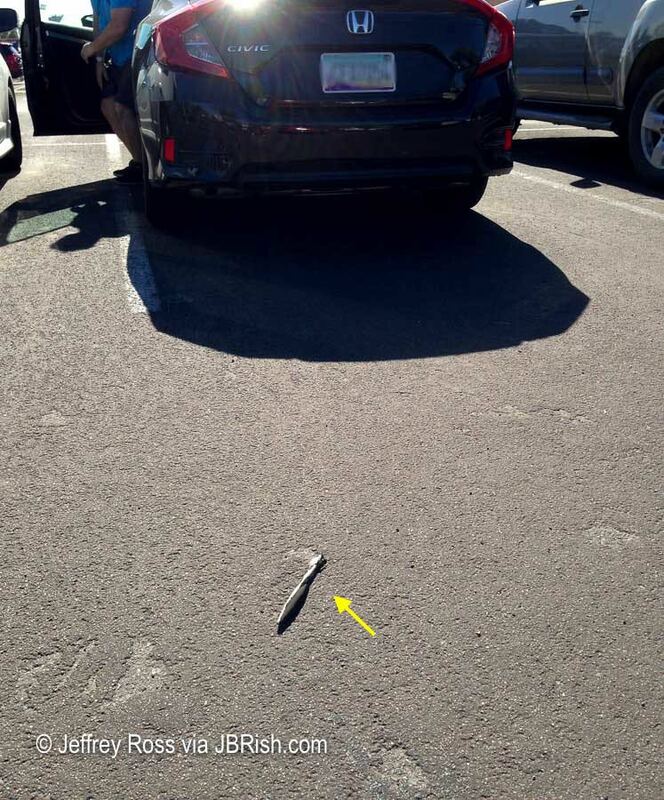 The car’s tire was less than six inches to the right of the razor blade.